As has been well documented this year Waverley was a huge and unparalleled success story in the history of novel publishing. As Ian Duncan has noted, Waverley sold more copies than all other novels put together in 1814 and it was to be republished in many editions in Scott’s lifetime as well as in numerous different collections and formats.1 Jerome Mitchell’s studies The Walter Scott Operas and More Scott Operas reveal how frequently Scott’s work was adapted into this particularly nineteenth-century form while H. Bolton’s Scott Dramatized offers a similar picture in relation to theatre.2 Murray Pittock’s The Reception of Sir Walter Scott in Europe has shown how widely and rapidly Scott was translated and the complex processes by which transmission of his work actually occurred.3 Most recently, Ann Rigney’s The Afterlives of Scott has provided us with a rich sense of just how pervasive Scott’s influence was in the nineteenth century and the mechanisms by which such influence fell into decline.4 However, while contemporary adaptation theory acknowledges that every adaptation ‘is inevitably an interpretation of that text’5 none of these works has fully addressed the ways in which the frequent adaptations, re-mediations and appropriations of Waverley influenced how it has come to be perceived in the popular imagination. While it is impossible to explore this thoroughly in an article of this length, three adaptations held in the Bernard. C. Lloyd Collection of Scott materials at the University of Aberdeen may prompt some further reflection on why the novel was so ripe for adaptation and of how such adaptations have helped shape and re-shape modern perceptions of it. The frequency with which editions of the Waverley novels reappeared in Scott’s lifetime is testament to both his popularity and to the shrewdness of Constable, and later Cadell, in repackaging them for different audiences. However, while ‘official versions’ of his novels appeared throughout Scott’s lifetime and beyond, unofficial versions were simultaneously appearing in the form of chapbooks. These short versions of the novels consist of around forty pages, frequently feature lurid illustrations and sold for 6d (around a fiftieth of the price of the first edition of Waverley). With Scott’s later novels such chapbook versions often appeared within months of the publication of the original novel (the chapbook of Guy Mannering for example appears in 1816, Ivanhoe in 1821 and Peveril of the Peak in 1823) the Waverley chapbook held at Aberdeen has a date of 1822.6 A similar pattern can also be found with other adaptations of Waverley; as H. Philip Bolton notes, the first dramatic adaptation of Waverley appeared in 18237 while here was no operatic version of it until the late nineteenth century.8 Interestingly the chapbook also bears the line ‘From the celebrated author of “The Pirate” &c, &c’ in its title page indicating that it was by virtue of the popularity of the later Waverley novels that this version of Scott’s first work of fiction was adapted. This delay between novel and adaptation meant that by the time the chapbook was published the story of Waverley must have been well established and aspects of how it is interpreted here may shed light on how Scott’s work was perceived in 1822. While the writer manages to pack a lot of the original plot into forty small format pages, many scenes considered crucial by modern criticism are absent. The scene by the waterfall where Flora seduces Waverley to the cause is completely missing and there is no description at all of Waverley entering the Highlands. Both these episodes are now recognised as containing complex and coded messages allowing multifarious readings of the text, but they are absent here. Similarly, the iconic painting with which the novel ends, and which has caused so much critical controversy in recent readings of the novel, is also missing so that the text ends with an unproblematic image of resolution; the baron’s ‘cup of joy …[was] indeed filled to the brim’ (p.40). 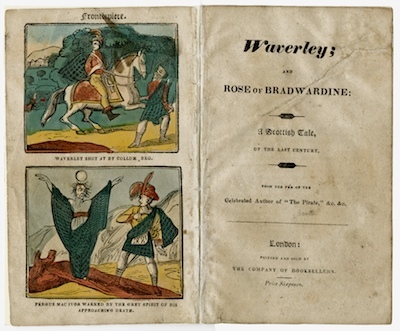 As its title ‘Waverley and Rose Bradwardine: A Scottish Tale, of the Last Century’ suggests, this adaptation is essentially one of the growing love affair between Rose and Waverley. Flora states from the outset that Waverley is not the man for her and encourages Rose to show off her ‘amiable qualities and talents’ in Waverley’s presence (p.14). Rose is invited to visit the Mac-Ivor household during Waverley’s residence there, ‘a summons which she obeyed with alacrity’ (p.14). As a consequence the chapbook is less an account of Scotland’s complex engagement with Jacobitism than a straightforward love story in which Rose grows in maturity until she becomes a suitable wife for the hero. One notable scene is, however, included and facilitates the chapbook’s frontispiece. Both after the skirmish near Derby and again towards the end of the narrative Fergus tells Waverley that he has seen the ‘grey spirit’ and this incident and this incident is pictured in a particularly vivid and lurid illustration. The 1822 chapbook offers an early example of the ways in which the process of adaptation of Scott’s work can allow the plot to be faithfully rendered (most aspects of the story are maintained) while simultaneously stripping the text of all the complexity and nuance that is so valued by criticism today. Nevertheless, teaching these chapbook versions of Scott’s work proves fruitful; confronted with them students frequently argue in favour of Scott’s one-thousand-plus-page triple-deckers, revealing that, for modern readers at least, meaning in Scott resides not in the skeleton of the story contained in these short versions (the larger structures identified by Lukacs as quintessential to them) but in what Franco Moretti describes as the ‘filler’ by which nineteenth century fiction in fact operates. It also claims a kind of posthumous authority stating that the engravings and embellishments are such as ‘had the Author himself now been alive, his personal tastes and resources would most probably have induced him to place before students of antiquity and lovers of art’ (p.3). Ann Rigney notes a long standing ‘interconnectedness between [Scott’s] writing and his house’ that culminates in the Abbotsford edition11 and indeed in Reliquiae Trotcosienses Scott himself draws a connection between story-telling and his antiquarian collections, noting that he cannot resist constructing narratives around them.12 However, the Abbotsford Edition presents a rather more simplistic correlation between objects and narrative than any Scott allows in Reliquiae and often objects are used with little or no relation to historical accuracy. Waverley contains five engravings on steel and around one hundred and twenty on wood and in spite of claims that the most accurate objects have been sought out for illustration many of these are curiously anachronistic; for example, when Waverley is taken to the Castle of Doune the chapter closes with an engraving of a set of spurs from Bannockburn and when the party meet in Edinburgh events are accompanied by an illustration of Charles Edward’s sporran attached to a belt from the time of the Knights Templar. In the light of the illustrations offered here it is perhaps not surprising that Scott has been seen as having a rather hap-hazard approach to historical detail. However, recent criticism and scholarly reconstruction have suggested that Scott is far more precise in his treatment of the past than formerly acknowledged and it is uncertain that he would have endorsed this edition as whole-heartedly as its editors suggest. More significantly, even if we leave historical inaccuracies aside the illustrations in the Abbotsford Edition of Waverley are problematic since they also put a particular interpretation on the text which is potentially at odds with the complexities that we now understand to be at play within it. This is, for example, evident in one dramatic engraving accompanying Chapter 24 ‘A Stag-hunt and its Consequences’. While the novel suggests an event fraught with political intrigue the image of the hunt carries none of this nuance. Chapter 47 ‘The Conflict’, which describes the Battle of Prestonpans, opens with an image of Prince Charles charging into the rising sun and closes with one of a pair of swords allegedly found on the field. Swords, this time from Culloden, feature again at the close of Chapter 62 ‘What’s to be done next’ rather oddly placed in the very chapter where Waverley has thoroughly abandoned the cause and meets Frank Stanley to receive his passport. However, the most overt and startling image of a sword appears on page 279, the opening of the chapter, that begins ‘to one thing constant never’. This is, of course, the chapter where Waverley, piqued by Fergus’s declaration that he is going to marry Rose Bradwardine, begins to examine his own conscience and decides that Rose, rather than Flora, is the woman for him. In many ways this chapter offers the first sign of Waverley’s disenchantment with Charles Edward Stuart’s enterprise and it foreshadows his inability to be ‘constant’ to the Jacobite cause just as much as his ‘caprice and folly’ in love. 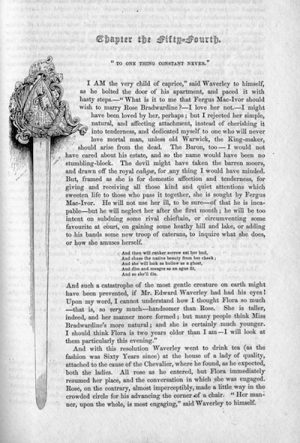 However, in the Abbotsford Edition the opening of the chapter is illustrated from the top to the bottom of the page with a claymore allegedly having been worn by the Prince and now, we are told, in the possession of the Duchess of Gordon; at the very moment when the novel voices scepticism towards the validity of the Jacobite cause the Abbotsford reinforces pictorially the sense that it is a thoroughly Jacobite novel. All in all such illustrations serve both to glorify war and foreground the Jacobite sympathies in the text in ways that may discomfort modern critics. Just where Scott’s sympathies lie in relation to Jacobitism has, of course, been much debated. Most recent criticism argues that Scott’s novel in fact rests on a curious tension that neither condones nor condemns the Jacobite enterprise, but the illustrations to the Abbotsford Edition of Waverley suggest a far more determined response than such re-evaluations allow. Flora then spoke to one of the girls in Gaelic – the language of the Highlanders – and Una conducted Waverley out by a passage. They walked up the wild and bleak valley, and in a little while they reached a glen which seemed to open into a land of romance, where the rocks took a thousand peculiar and changeful forms, and where they came in sight of a beautiful waterfall. Flora was already standing by the waterfall, while two paces back stood Cathleen, holding a small Scottish harp. For those of us of an age to have been brought up on Enid Blyton it is hard not to re-title this version of Waverley ‘Five go to the Jacobite Rising’. Perhaps even more than the chapbook version it is a story stripped of all Scott’s complexity and subtlety. While political intrigue is not lacking from the text, as befits a children’s edition it is offered in a particularly saccharine form; nothing is really at stake here and the tensions that we now recognise as so crucial to Scott’s novel have more or less disappeared. This short look at three adaptations of Waverley may gesture towards the reasons why perceptions of the novel persist that seem so much at odds with modern critical understanding of it and may also go some way to explain what seems at times like an unbridgeable gap between those who believe that they understand Waverley (and often condemn it without having actually read it) and those who praise both its complexity and its ongoing relevance for a modern age. It may also suggest why Scott’s work lent itself so well to adaptation for what is most interesting about these re-workings of Waverley is the fact that, strange though they may at times appear to a modern reader, they do not necessarily misinterpret it. Rather, they are in fact facilitated by the many possible meanings that reside within Scott’s multi-layered and ambiguous text and the capacity for reading and re-reading which it generates; these adaptations are not ‘wrong’ about Scott, but they inevitably follow one of the trajectories on which his novel takes his readers while ignoring other possibilities. While recent criticism recognises that what is most stimulating about Scott is precisely the fact that such multifarious meanings co-exist within his fiction, taken singly any one of the meanings that may be contained within Waverley, or any other of Scott’s works, is an occlusion of this complexity. All adaptation is indeed an act of interpretation but the adaptations we have explored here each offer only one interpretation. The real genius of Scott’s Waverley is that it allows multiple, elusive and at times competing interpretations of the past and its relationship to the present to co-exist within one ground-breaking work of fiction. That perhaps, is why we are still reading it after two hundred years. Ian Duncan, ‘Introduction’ in Waverley, ed. P.D. Garside (London, 2011), p.xi. Jerome Mitchell, The Walter Scott Operas (Alabama, 1977) and More Scott Operas (Lanham, 1996); H. Philip Bolton, Scott Dramatized (London and New York, 1992). Murray Pittock (ed), The Reception of Sir Walter Scott in Europe (London, 1996). Ann Rigney, The Afterlives of Walter Scott: Memory on the Move (Oxford, 2012). Rachel Carroll, (ed)., Adaptation in Contemporary Culture: Textual Infidelities (London, 2009), p.14. Sir Duncan Rice Library WSH8. H. Philip Bolton, Scott Dramatized (London and New York, 1992), p.49. Jerome Mitchell, The Scott Operas (Alabama, 1977), p.29. Sir Duncan Rice Library, WSE13. Richard J. Hill, Picturing Scotland through the Waverley Novels: Walter Scott and the Origins of the Victorian Illustrated Novel (Farnham, 2010), p.45. Walter Scott, Reliquiae Trotcosienses, ed. Gerard Carruthers and Alison Lumsden (Edinburgh, 2004). Sir Duncan Rice Library, WSW15. Alison Lumsden is Professor and Chair in English at the University of Aberdeen. She is President of the Association for Scottish Literary Studies and Honorary Librarian of Scott’s library at Abbotsford. In 2010 she was awarded grants from the British Academy and from the Carnegie Trust for the Universities of Scotland to begin work on a scholarly edition of Walter Scott’s Poetry. The preliminary stages of this project are now complete and the main stage of this project underway. The first volume will appear in 2018.